b) A license to kill. At around 2 AM in the morning, my tormentors left the train. I was too stricken to even celebrate. I forgot what joy was like. And it was then that I fell asleep for the 1st time since 6 hours. I dreamt of me and a friend of mine going for archery classes (!?!). The next morning, when I woke up, the Adam’s family was replaced with an American couple. After I freshened up and noticed that there was no room for (even) me to sit in my mom’s compartment, I took up a place opposite to the American couple. They introduced themselves as Rolfe and Genal (I hope I spelt your name right!). They were a nice couple from Colorado who were on a tour of the country. We talked about politics, did a bit of George Bush bashing, and talked about education, movies and a lot of other things. It was quite a relief considering the ordeal I had to endure the previous night. At 11:00 AM, my journey was over and I got down with my mom at Shoranur station, found my uncle soon enough, and we drove home…sweet home. This entry was posted in Life, Non-Tech on December 26, 2007 by lalithsuresh. Uhm, was that the most noteworthy train journey of your life?! It’s hard to believe how commiserating people tend to be when they bring their kids along. And it isn’t very easy when you’re living in a country with the second largest population in the world. So, that would mean a helluva lot of kids (or brats, as you prefer) screaming in your ears while you try to sleep, wouldn’t it? 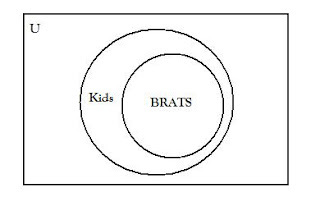 Oh, and I really like the Venn diagram. only two thing to say….